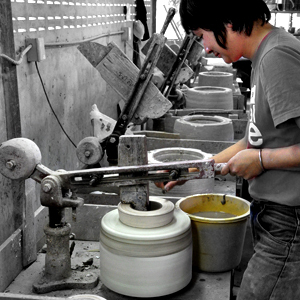 In the ceramics world, jolleying is a method of shaping the inside of a plate or pot – the inner shape of the ware is made with a cutting material (metal or rigid plastic), and the clay is placed on the pottery wheel. As the clay spins, the cutters shave and shape the ware. In this case, into a Brown Betty. It is very similar to hand-throwing a pot and using your left hand to hold the pot centered and your right hand to create the depths of the pot by pressing down against the wheel and out against your left hand. Your right hand is acting as the jolley (your left hand is doing the jiggering but that’s another topic altogether!). 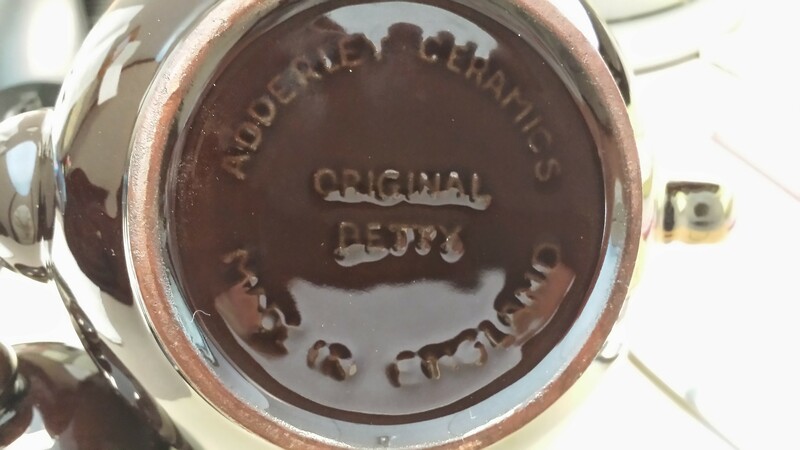 Originally the Brown Betty was made this way and the spout attached separately. Because there is shrinkage during the firing of the clay, creating a lid that nests properly can be a challenge if the thickness of the walls of either the pot or the lid is not standardized. Currently, the Brown Betty employs the slip casting method. Not only does this take less time, but it offers more consistent and precise results. The spout is an integral part of the pot, making it sturdier. Slip casting involves creating the mould, mixing the original red terra cotta clay with the secret ingredients to make the Brown Betty “slip,” smoothing the unfired pot, firing the pot to set the clay, dipping in the secret-ingredient glaze, wiping the excess to give you that plain little ring on the underside of the teapot that I love, and refiring to set it all for generations to come. The lid has a mould that allows the finished lid and pot to settle into one another perfectly. My first degree was in art, and I have taken ceramics classes. I know how to fire, how to wedge the slip by hand, and how much damage a mechanized pottery wheel does after a night of partying when you aren’t paying attention. Ask my friend Raychel. 🙂 I also believe that hand-throwing a pot adds sensuality and uniqueness to a piece, which is invaluable if the recipient is connected to the potter, or wants a unique piece with unique blemishes and characteristics. If the recipient wants a piece (s)he can count on to be of a certain standard, size, durability, and thickness for heat transfer without relying on the whims of the wheel, slip casting is the way to go.